I loved Copenhagen! What a beautiful place with such a cool vibe and even cooler people. Danish people are some of my favorites, they’re calm, cool, and collected and have this understated chicness to them. This city is different to some of the other European cities. It’s more hipster, grunge, and more people just cool not trying to prove anything or adapt to the more Western norms. It’s classic, charming, and truly colorful! I loved all the architecture there and all the buildings and boats. There is also so much to do and so many different vibes you can go for. Here is a list of my top 15 things to do! 1. For accommodation stay at THE ANDERSEN HOTEL, it’s a great location, 5 mins walk from the train station, 8 mins to Tivoli Gardens, 10 to The Meat Packing District where there are lots of cool bars and restaurants, and 25 mins walk to the Rosenborg Castle which is unique and so stunning! The hotel is a boutique hotel with a colorful and funky lobby, free wine hour, an amazing spread for breakfast, and the rooms are newly renovated and so stylish and fun. They are immaculately clean, large, and have Molton Brown products for all you lovely ladies and of course free Wi-Fi. 2. Rent a bike from Andersen Hotel for the day and ride around to see the sites. This is by far the most popular way to travel around the city to see the sites. They come with a lock for the tire so you can leave the bike anywhere and not have to worry, there are special bike lanes and paths so you are super safe, it’s an option for at least one of the days and is a nice activity, especially riding along the river and parks. The bike I rented at THE ANDERSEN HOTEL were adorable and had a cute basket for my handbag and camera. 3. 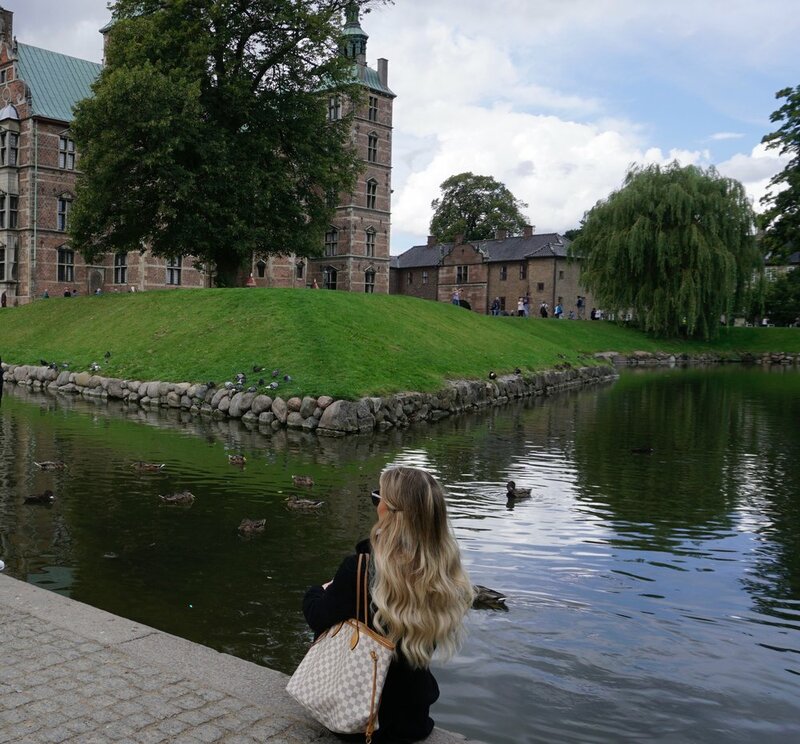 Go visit Rosenborg Castle. It is so beautiful and different to many of the castles in Europe. I love the thin sleekness of it. It has a small beautiful garden in front of it and a very nice park on the side you can walk through to get back to the main street. It’s lovely for photos here. 4. Go walk along the river near Nyhavn. This is the area in Copenhagen most popular in blogs and social media with the colorful houses and restaurants on the water. It has some amazing cafes, restaurants, and atmosphere. It’s most represents Copenhagen in my opinion for tourists. It gets very busy as it’s super touristy so try to go in the morning for the best photos and to enjoy a nice stroll with less people. 5. Go check out Tivoli Gardens! It’s one of the oldest and most fascinating amusement parks in Denmark and it’s beautiful, historic, and rather charming. It isn’t very expensive to enter, around 20 USD. There are rides here, Tivoli Garden which is so so beautiful, and fun gift shops and restaurants. They also do a light show at the end of the night which was cool. You really should check it out, you could even go for 2-3 hours and that’s plenty depending how many times you want to go on rides but you could go on them all in that duration. 6. Go have a picnic in the park, there are so many nice parks in Copenhagen, and on Fridays people go there and drink wine and have lunch and enjoy themselves, (weather dependent obviously) but they are nice. 7. You could go see the famous mermaid statue but in my opinion and all my Danish friends I met said it’s over rated. It’s just a small statue of a mermaid. It’s out of the way as well in my opinion but again if you really need to see it or love mermaids then be my guest. I saw the mermaid statue in Singapore that is similar and one of the attractions there and was quite underwhelmed. 8. Go visit Christiania, aka Freetown Christiania, a self-proclaimed autonomous anarchist district, in other words it’s a hippie neighborhood that gained its freedom from the government and Danish police and now it’s 1,000 residents live under their own set of “rules”. It is said to be dodgy due to the hash selling on the street and crime that has happened but honestly, I went for lunch and had the best time, it reminded me of Venice Beach. I didn’t feel in harm’s way at all. You can take some photos but do not take any of the hash dealers or on the main street as you could get confronted. It’s not a dangerous place just be smart. It’s visited by many tourists daily so you’re safe. Go have lunch and a smoke and enjoy the hippie life of no rules and peace and love. 9. Take the train 45 mins to Kronborg castle. It’s another castle and has so much history and fame as it was in Shakespeare’ Hamlet and is probably the most famous castle in Denmark. It’s along the water and really is amazing! Go see it. You only need about an hour or two here to take it all in and get amazing photos. This is now a UNSECO site and is a must do. Trains from Central station run every 20 mins. 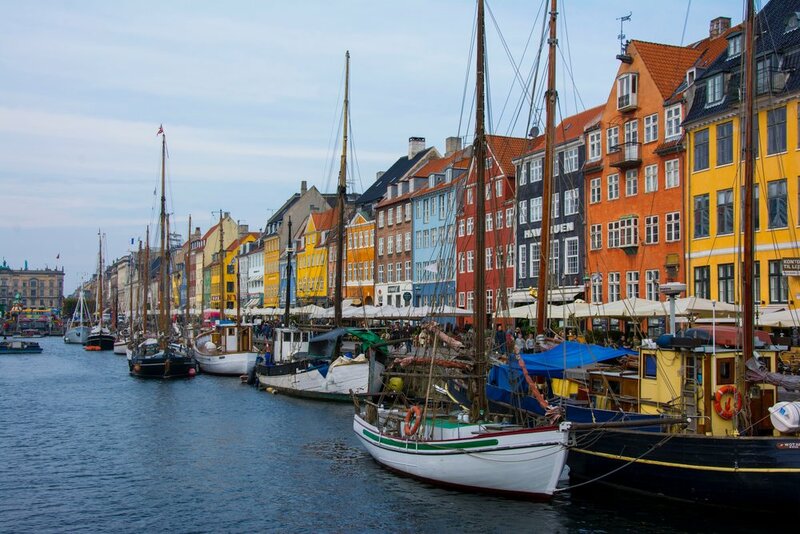 Other Tips and things to do in Copenhagen. 1. Get a Copenhagen card before you visit and that will give you free entrance to many of the attractions and fast lane as well. It’s a no brainer if you intend on visiting the castles and the museums and it will save you lots of money. 2. Bike around the city, it’s safe and a great city for it. Use hand signals and stay out of people’s way as the locals cycle fast so slow traffic to the right. 3. Remember that it’s DKK so you need to exchange cash before but remember a lot of places take debit cards just not all places take other credit cards so have cash on you. 4. Take the train from the airport to the center of town, it’s cheap and quick! 5. Go and splurge on at least one nice meal as Copenhagen is full of Michelin starred restaurants. 6. Holidays are a great time to come for the Christmas markets which are not as gaudy and commercialized as the neighboring countries and their markets. 7. Denmark is expensive so just prepare for that, don’t waste your meals. 8. Danes speak English and amazing English, as in I asked a few “Where in America are you from” HA! They sounded American to me but some have close ties to America or they watch a lot of movies. 9. You don’t need to tip, Danes make a great salary, you will not be looked at wrongly if you do not tip, if you want to leave a buck or two for exceptional service than do so but if you’re on a budget as again it is an expensive country then don’t worry about tipping as it’s not expected. 10. Don’t speak on your phone inside as it’s seen to be quite rude here, but honestly, I think it’s rude and annoying anywhere if someone is loudly speaking on their phone while you’re trying to eat or drink or work etc. 11. It gets very cold here in the winter so if you come to celebrate Xmas make sure you pack a water proof coat and extra sweater! 12. Most Danes don’t go to church and are atheist. I know, I couldn’t believe it when I sat down with a friend here and they told me. It’s rare to meet anyone who goes to Sunday church or believes in God or Angels. 13. If your feet are really killing from walking, or your bum is killing from cycling, go take a boat cruise, yes, it’s cheesy and touristy but still a break from walking and you get nice views. 14. Go have a coffee and cake at Mad and Kaffe, a very popular place for all the Scandinavian bloggers. 15. Walk down the street near Andersen Hotel and experience the old red light district. It’s for sure an experience, at least it was for me. It seems dodgy but you are safe I promise. I walked it alone a lot and never got hassled once. 16. All you need to know in Danish is SKAL which means Cheers and TAK which means Thank you, there is also no word for please, Danes are just such nice people they will think you imply it when you ask for something. Use your English with everything else. 17. Visit paper island, a great food market with lots of variety. 18. Grab a hot dog, I don’t eat meat but if you do, this is the very best place to have one! 19. Check out the aquarium, the architecture is amazing and the range of fish is also spectacular. This is a special aquarium where it really teaches you the importance of taking care of the oceans and the animals within it. 20. If you want a work out and great views, go kayaking on the water front just make sure it’s warm and that you truly know how to Kayak. I’m not an amazing kayaker. I tend to just go in circles but hey! Whatever right?